When i was in Wisconsin i picked up a couple flour sack towels. i love them and they are easy to embroider and look great when finished. 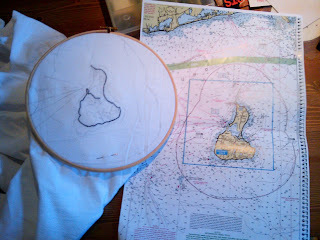 So i am using copies from my sea charts to make different islands on the towels. i think they will work as table cloths too. I will use my sewing machine to make the pink lines and then hand sew on the island bit. This first one is Block Island. Wow I love that idea! Super smart.